Dungeon Hunter is back! But this time, you will be recruiting more “champions” to vanquish evil. There are more than 200 characters to collect and upgrade and each character has a set of unique set of skills that can come real handy against giant boss monsters. This action RPG boasts several modes, such as Co-opp, Boss Raids, Blitz, Arena, 5 vs. 5 and Adventure mode. There are lots of rewards to collect, and you are lucky if you have pre-registered for this game as there are lots of pre-registration rewards waiting to be collected. Before tapping the “Battle” button on the versus screen, check the “recommended elements” section. You may select a champion based on the info provided or just ignore it. I would recommend going by the game’s suggestion because it’s based on the enemies you will be facing in a scenario. The game will recommend an element that’s stronger than enemy’s element(s) and so choosing a stronger elemental character would be a wise decision. For example: The game will display a list of possible enemies you will face in a scenario. 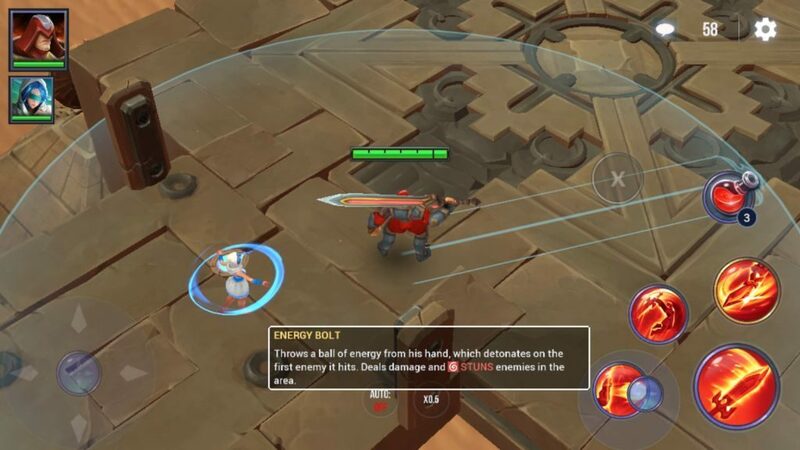 It will also show enemy elements. So if all enemies’ dominating elements are Nature and Fire, the recommended element under your party will only be “Fire” because Fire is stronger than Nature and there won’t be any elemental advantage over an enemy (and vice-versa) if he belongs to the same Fire element. 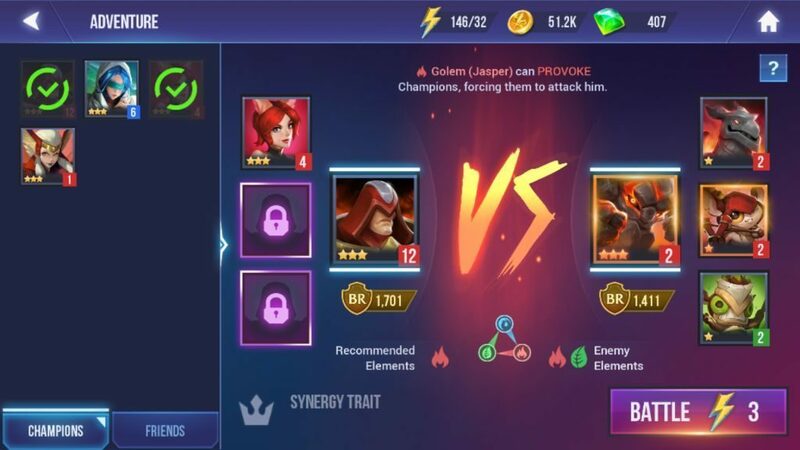 You should select the main champion and other party members that belong to the Fire element. Just make sure that the character(s) you select is a high-level champion and boasts higher rarity (three-star or above). Along with selecting characters that belong to a stronger element, you should also pay attention to your party’s total “Battle Rate”. The total BR is the sum of your chosen characters’ battle rate. With a high BR, winning a battle won’t be too difficult. While these two factors do play a key role in battle, using the right skills at the right time and having a ranged – melee – support champion combination will help you snag a comfortable win. 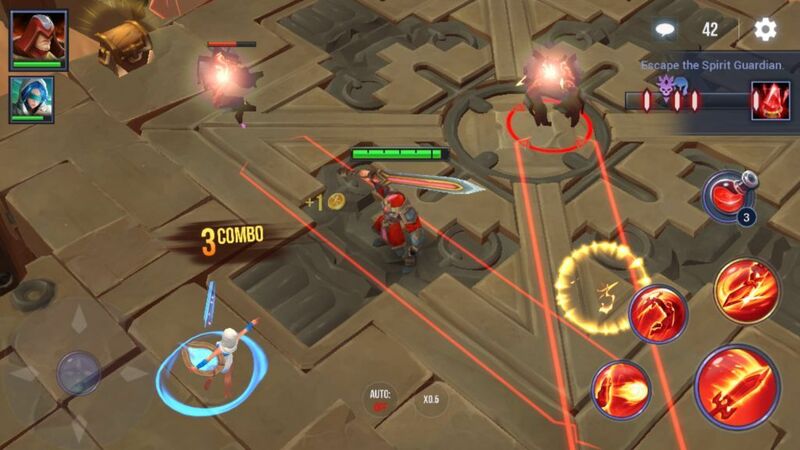 While battling enemies in Dungeon Hunter Champions, you may have noticed lines and circles around them. These red circles and lines are actually an enemy’s attack range and appear just before an enemy launches an attack. 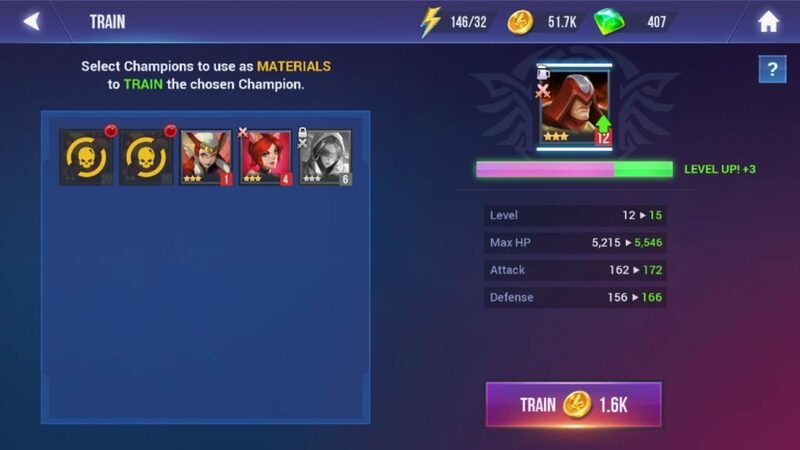 You will have to use low-grade champions (Example: one-star “power-ups”) as materials to level-up selected characters. To train, tap “Champions” and then tap on a champion’s portrait. On his/her info screen, press the “Train” button. Select one-star or duplicate champions that you don’t need to level-up your character. You will also need coins to complete the upgrade procedure. When your champion levels up, you will gain BR points. You may receive gear when you complete a scenario in Adventure mode. When you get one, head straight to “Champions” section and tap a champion. Next, tap “Gear” and then tap each empty slot to check available gear for that slot. 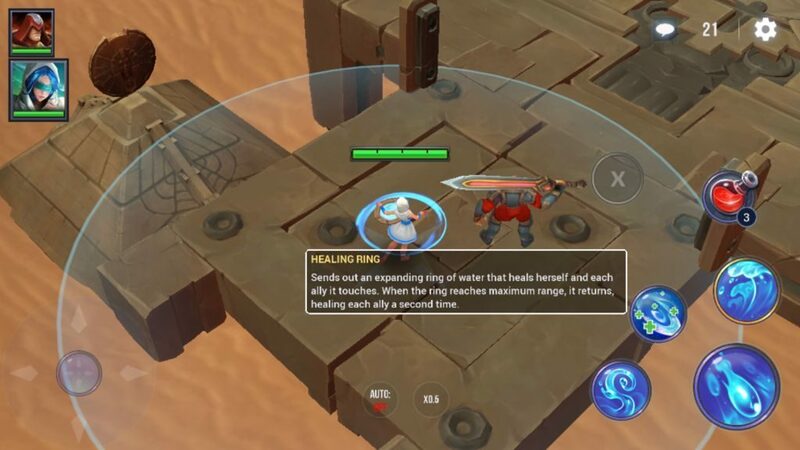 A red arrow will show at the top of each slot, which suggests that the slot can be equipped with an item. Before adding an item to a slot check its BR. The BR value varies from one item to another. 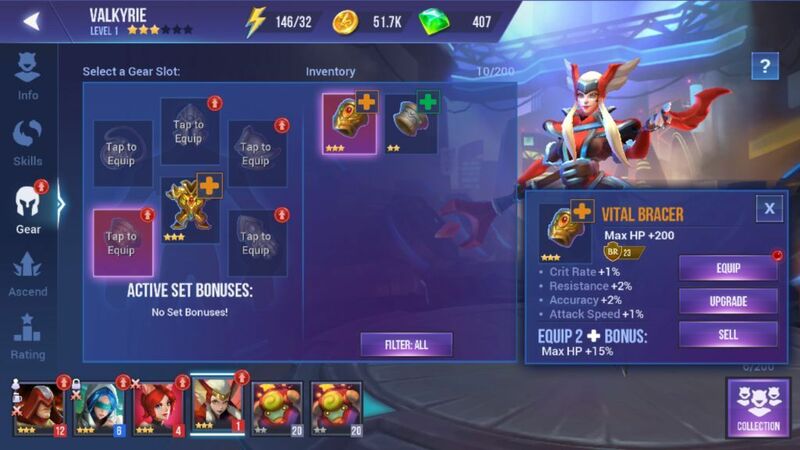 Usually, one-star items boast lower BR value. 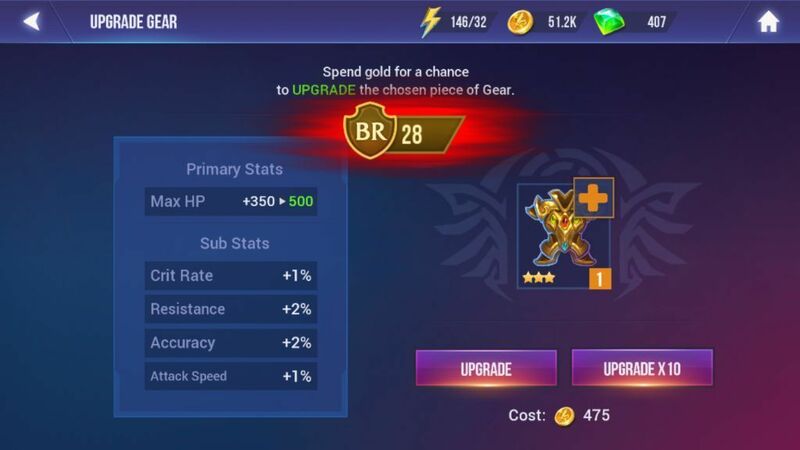 You can upgrade gear, such as Shoulder, Bracer, and Armor to increase their BR value. You just need to spend coins to raise battle rate. You can then equip the upgraded gear to a champion add those extra BR points. You can also upgrade a gear that you have already equipped to a character.